Sounds fine, doesn’t it? Countersigned NDA filed in the company’s records, check. Possible collaboration with the guys at XYZ Corp., check. Mutual NDA that states what’s ours is ours, check. 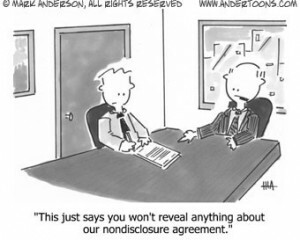 But is the NDA, or Non-Disclosure Agreement, a simple business-process document that’s as everyday as a purchase order, or a legally binding document that opens up the potential of intellectual property (IP) issues later? And what about those IP clauses in your standard employment contract? French car-maker Renault recently suspended three senior execs in what was described as a sophisticated case of industrial espionage. The case revolved around electric vehicle programs and power train and battery technology. Chinese companies have been named, but involvement has been denied. The exchange of trade and technology secrets, both legitimately and non-legitimately, has been happening for hundreds of years. The Renault case has brought the competitive nature of IP back into sharp relief. Stories of Chinese manufacturing ripoffs have been rife for decades. This was considered somewhat okay in the days when China manufactured for export, with the theory being that if goods had been made from infringed patents, they’d just be impounded at the port of entry. Now, however, home markets in China and India can be bigger than export markets – and in the case of EADS, the owners of Airbus, industrial espionage in China is a reality. Internal flight to Shenzhen anyone? China’s commerce minister, coincidentally, recently invited leading executives of western companies to talks to address the IP issue once and for all and, it could be assumed, open up the channels for greater cooperation, collaboration and commerce. Public burnings of counterfeit DVDs and books have been widely publicized to demonstrate intent. Well that’s all right then. Beijing is drafting its five-year plan for the development of a framework for economic policy. The plan will account for creative industries, IP development and international collaboration. Sounds like an excellent plan. Have you seen the counterfeit version of the iPhone, by the way? I can’t read Mandarin, but it looks very nice, though a bit thick for my liking. So how do governments and global corporations resolve this trading barrier and open up markets? Western companies are going to have to engage; they simply can’t ignore the consumer volumes in Asia. For its part, China has got to accelerate change. Public burnings are a pretty clear indicator that Chinese public authorities simply don’t get it. At the base of all this is human nature. NDAs, memorandums of understanding and the like simply will not offset the exchange of plain brown envelopes, personal ambition, greed and, in some cases absolute naivety. What is required at the macro level is a proper commitment and both corporate and executive prosecutions. At the micro level, there is a real need to think smart. IP is currency. Do you protect and publish your IP through patent process and entrust the Madrid Protocol, or simply keep a very tight hold on your source code and your employees? When it comes to the NDA, don’t simply sign on the assumption that it’s a gateway to further opportunity. Two years from now, if the other party claims “priority” on the technology you think is rightfully yours that was discussed under NDA, it could be expensive and potentially catastrophic for investors and stakeholders. It’s very difficult to un-hear things. At that first meeting it’s always a good idea to dance around your handbags for a while. Where there’s mystery there’s magic, and in the case of a startup meeting a significant suitor for the first time, this is no bad thing. Phil Newman is a London-based marketing and commercialization strategist for technology companies. We welcome your comments.